Tree risk assessment provides an impartial basis for tree owners to make decisions on reducing risk posed by tree failure, such as through improving tree health and structural stability, moving high value targets, or removing the tree. Assessment includes collecting information on tree and site conditions in order to assign a likelihood of failure to the tree, in whole or in part, the likelihood of contacting a target, and the consequence of that contact. These likelihood determinations are summarized as a ranking of risk from low to high, providing a basis for tree owners to make decisions that mitigate the risk. Recommendations include suggestions on how to mitigate the risk. In the Columbia Gorge area, BAC commonly find large trees with elevated risk because of the following conditions: advanced heart rot decay, co-equal trunks with weak unions because of included bark, trees with large long limbs at risk of breakage as well as cracked or hanging limbs, trees with decay or mechanical damage related to excavation and grade filling during construction, trees that were poorly pruned -- over-raised or with limbs "lion tailed" which can increase failure risk, and trees with support cable systems that were done poorly done or failed. We have also assessed large trees near homes that did not have major defects, but were a concern simply because of size; we determined that they could be retained with proper management of structure and health to maintain them at a moderate risk level. Our reports provide options to mitigate risk, such as by crown reduction pruning, cabling, improvement of root health, or removal. Moving high value targets is not often an option with a large tree near a home, but would be appropriate on large properties or public spaces where play areas, picnic tables, or parking spaces can be moved. BAC invites requests for estimates to perform risk mitigation work, completely separate from our risk assessment reports in agreement with professional practice rules. Safety is the paramount objective in pruning, which may also include objectives for improved aesthetic appeal, views, clearance for buildings, or increased light or spacing for other trees or shrubs. BAC typically recommends pruning the entire tree, in order to have the climber inspect areas high in the crown not easily seen from the ground; although cuts in those areas are often limited to light thinning or cleaning of small dead limbs, large weak limbs or tops may be discovered that should be removed or reduced. 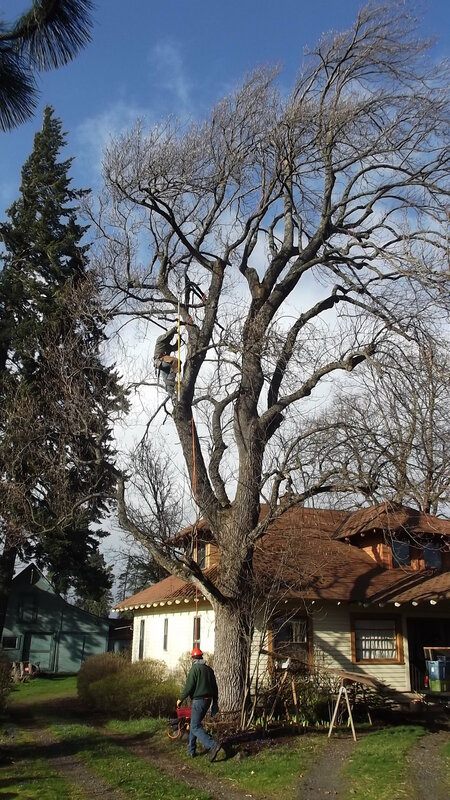 Safety objectives of pruning include removing cracked green limbs, large dead limbs, and end-weight reduction through thinning and drop-crotch pruning to reduce the weight at the ends of long lever arms -- limbs that may reach 30 ft. or more. Aesthetic objectives overlap, in that uncovering the structure of the trunk and large limbs is pleasing to the eye, and is the result of removing dead and weak limbs and thinning the crown. Requires the creation of a defensible area. Fuel reduction is key to reducing fire danger. This means removing significant dead fuels and their connectivity to vegetation layers and patches at the landscape scale. In practice, a zoned approach is recommended around homes, structures, and access routes to produce defensible space with the least fire danger close to these areas. Many properties in the Hood River Valley and Columbia Gorge are currently in need of this work. We can develop plans with landowners to reduce fuels while maintaining ornamental trees and vegetation, as well as reduce risk on forest land while maintaining associated native plants and wildlife habitat. Fuel reduction is best done in the winter and spring, before fire danger increases with summer drought. This reduces the risk of accidental ignition during the work, and once completed, will be effective in the following fire season. Grant money is available for this work as well as bark beetle mitigation (thinning), which also reduces fire danger. The installation of a support system is done to mitigate, or reduce, failure risk of trunks or large limbs. They can be as simple as a single cable between two trunks to limit sway and prevent cracking in the union, or multiple cables plus braces in the forks between large multiple trunks. This is done in conjunction with pruning, as well as a Risk Assessment in most cases. Not all trees are candidates, depending on condition; non-invasive support systems (e.g., the Cobra System) can be used. It must be used if the pieces to be attached together have internal decay, because drilling for anchor installation breaches decay areas from which decay fungi may advance into sound wood required by the anchor, leading to failure of the support system and tree part. Pruning is typically done in conjunction with installing a support system, because it reduces some of the forces that the support system is designed to dampen, and improves efficiency because climbers are already in the tree and can do the pruning as part of the job. Pruning and inspection of the support system are also recommended on a regular basis after installation.